Netherton United manager Jon Harrison. The Peterborough Premier Division table-toppers are in quarter-final action at the Grange tomorrow (January 7) when hosting Northants Combination League side Corby Pegasus (2pm). Netherton striker Tom Randall (centre, red) will be a key man in the Northants Junior Cup match against Corby Pegasus. 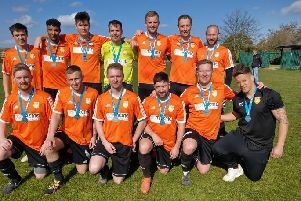 Netherton reached the final last season before losing to the all-conquering Peterborough Sports side in the final at the ABAX Stadium. Harrison said: “The league will 100 per cent always be our priority, but this cup is a major target as well. “We performed superbly to reach the final last season and there won’t be a team in the competition this season anywhere near as good as Sports. Action from a recent Netherton United (red) game against AFC Stanground Sports. Harrison expects Netherton to be knocked off top spot before they play their next Premier Division match on January 21. Next weekend (January 14) Netherton tackle Peterborough Sports Reserves in a President’s Shield match. Netherton are certain to retain first place this weekend as second-placed Pinchbeck United are in Lincs Junior Cup quarter-final action against Nettleham at Knight Street. Langtoft travel to Coninsgby in the same competition. Moulton Harrox will jump into second place if they win at struggling Uppingham. “The title race will go down to the wire,” Harrison added. “I’m happy with where we are, but there’s a long way to go.